YES WE CAN and so can Michelle Obama! From the concession speech by John McCain to the incredible crowds all over the country, last night was pure magic. It’s the closest thing to a miracle I’ve seen in my lifetime. Transformation is upon us. I really believe that. I was so inspired by Obama’s acceptance speech … I was brought to tears several times while he was speaking last night. 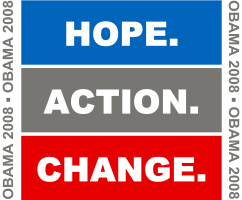 I’m feeling so much hope for the future – not just because Obama is now President Elect Obama, but because of the thousands of people across the country who voted for the first time – no matter who they voted for – and because I saw hope in the faces in the crowds last night after the decisive victory. As a tribe it seems we have been in a depressed, fearful and deeply apprehensive place for the past 4-6 years … especially since 911. I feel that lifted last night at least for a moment in time. Reality will be upon us but it will come with a lingering sense of hope for the future. Well, enough waxing philosophical. 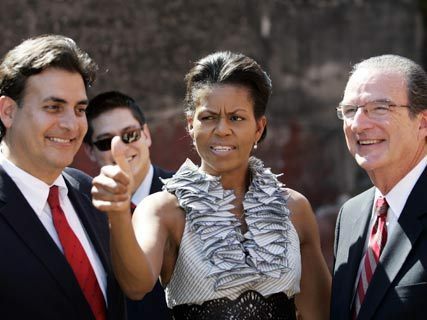 I love Michelle Obama … her loyalty to her husband and family, her poise, her intellect and integrity. Still, the black and red dress. So sad that she chose it. I think it was an anomaly. She isn’t known for wearing “cheap” looking clothes. All right she does shop at White House/Black Market, J Crew, H&M and other middle of the road retail outlets but … that’s where I shop. So I’ve been liking what she’s worn on the campaign trail for the most part. And, she’s taken us back to wearing feminine yet strong clothing. That said … now she can pump up her wardrobe a bit and I’m sure she will be spending a bit more on her clothes within her personal and progressive style choices. Michelle, her husband and their two girls, Malia and Sasha. But as Charlotte Observer’s Style Editor says “Self confidence is sexier than any stiletto or tight dress. And it matches everything you own.” Enough said I think. Self confidence she has in spades. Here’s a little fashion trip down recent memory lane. I don’t think she did too badly with her choice of dress on the campaign trail. 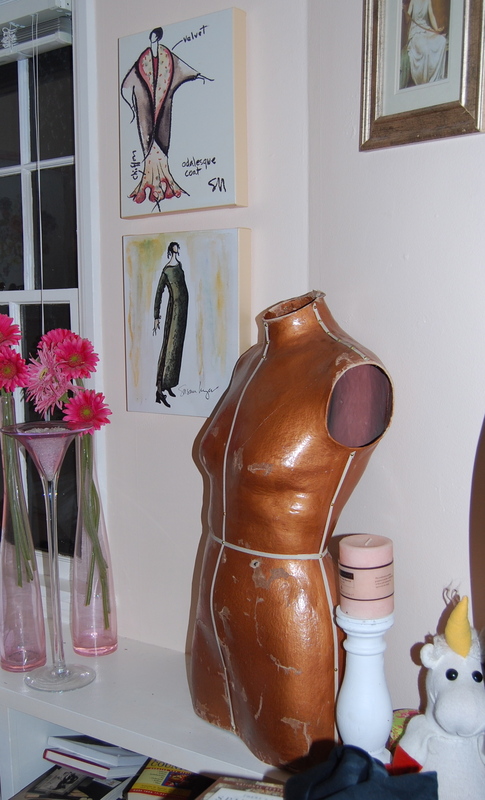 Lily Atelier in Camas … you know the other side of the River? Owner Dawn Stanchfield is an incredible buyer. I was there last Monday checking out all the cute little boutiques downtown. I asked Dawn where she goes to market and her answer was the same as most other clothing boutiques in Portland. She shops in Atlanta, Seattle, San Francisco. But she finds very unique, gorgeous clothes even though she shops and buys for her store at similar markets. Her clothing selections is wonderful because she carries sizes from 2 to 16. Love that! across the river and check out this store. And to top it off — her customer service is legendary. She knows her clients so well that she actually buys for them when she’s at market. She’s famous for calling clients when her orders come in and saying things like: “Your coat is here!” You keep going girl. Camas Antiques (across the street from Lily Atelier in downtown Camas) is hosting their very own Holiday Open House on Friday, Nov. 7 from 10 a.m. to 8 p.m. and Saturday, Nov. 8 from 10 a.m. to 6 p.m.
FREE CHRISTMAS ORNAMENTS (first 50 customers Friday and Saturday). Local author Fran Gillette will sign copies of her cookbook “The Old Farmhouse Kitchen” on Friday morning. And there’s dealer sales, free kettle corn and apple cider! OMYGOD. I haven’t blogged in five days. FIVE DAYS??? And I haven’t even been on vacation or anything. Well, not really. I did clean off my desk one day. And another day was spent preparing a pitch for a new client. Other than that, I can’t account for my time. Crying out loud. That’s scary. Must be twittering too much. I have been reading other people’s blogs. That accounts for hours going by the by. Oh and creating another blog or two and a couple of web sites and … well, you know. Speaking of social networks, isn’t it great when you start getting to know someone who was an acquaintance and then becomes a girlfriend and chica? I’ve been getting to know several women on a more personal basis lately … no, not that personal. One of them, Krista, is an organizer extraordinaire and all around funny woman. She had a vintage hat on her latest blog and was waxing philosophical about her favorite things. I love to wax philosophical myself. So I thought I’d share a few of my favorite things. (Right) I love the velvety ribbon and the height of the heels. 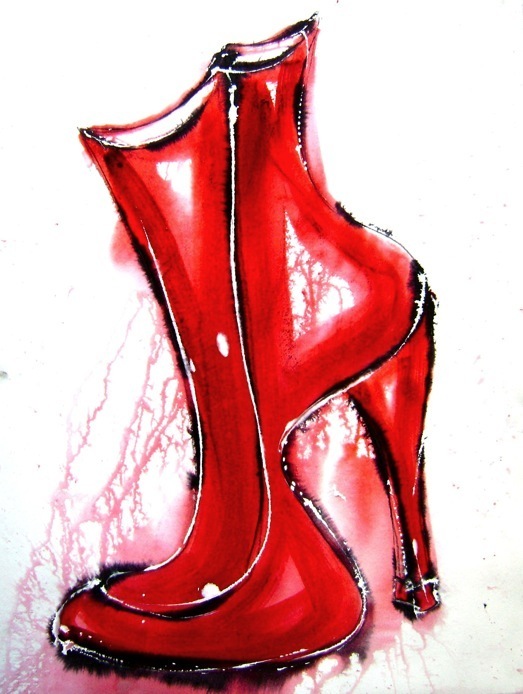 Not that I could ever wear that high a heel without have to have 24/7 chiropractic support but … I love to look. Mrs. Severn certainly had one of the most enviable forms in the entire city. Her gold lame coating may be distressed but her form is flawless! 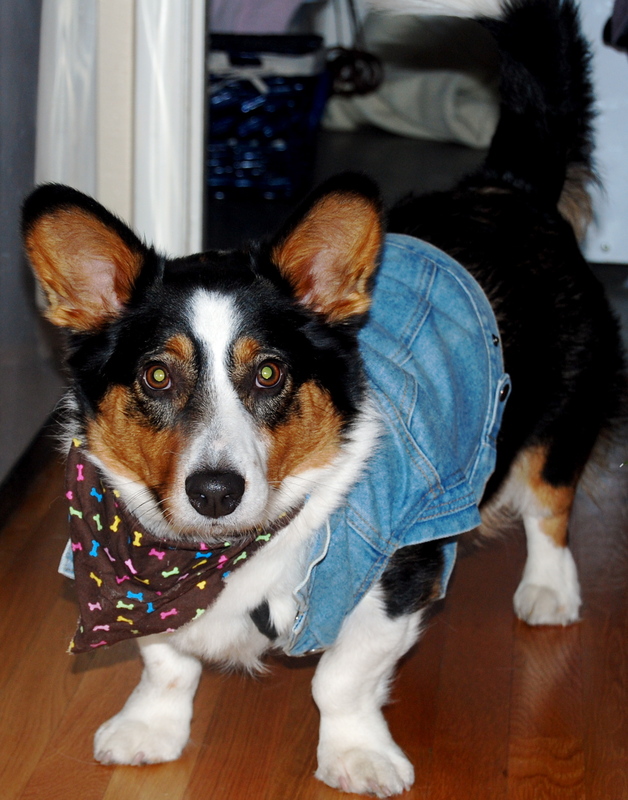 And of course my very favorite little chub is Sawyer thecorgi (his name – long story). He’s just barely two years old (Sept. 2). 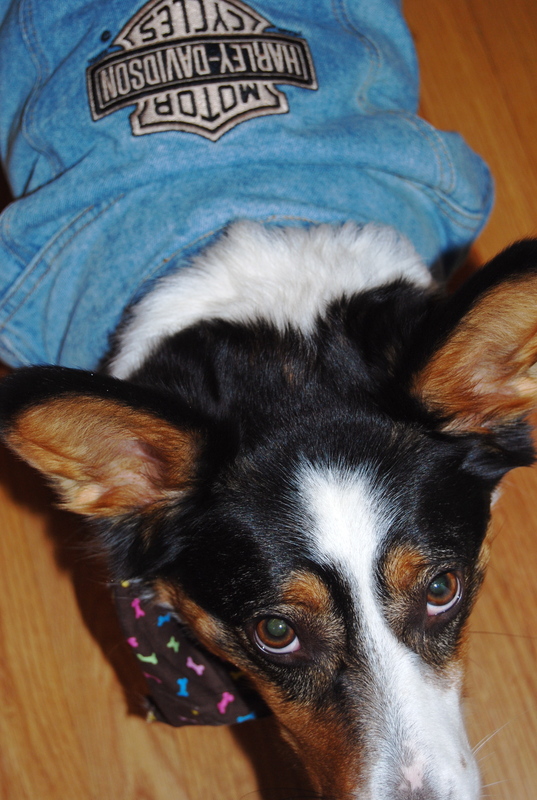 Sawyer is a Cardigan Corgi. Unlike the Pembroke Corgi’s – Cardigan’s have their tails intact, they’re a bit longer and they have a bit better temperment. Adorable … I know. He is the smartest dog I’ve seen, easy to train, lovable, gets along with everyone … animals and people alike and loves to herd all of the above. He’s wearing his 2008 Halloween costume, a Harley Davidson jacket complete with scarf. (Right) is another view from the top. Wearing a costume isn’t his favorite way to spend the day! I’m so easily impressed. Answered my cell this afternoon and barked into it as usual, antcipating another sales person that won’t leave me alone and caller was Mark Schwartz (shoes as art) thanking me for the blog I did yesterday and he’d noticed I hadn’t put a link to his blog. Mea culpa! Somehow I didn’t save it before I quit writing last night. Nice gentleman. Sounded very artistic … hehee … what does an artist sound like? Love the work at the left. 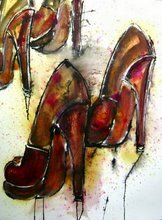 Honey if you can’t buy the shoes can you buy me the painting. That’s for hubs if he’s reading my blog. I LOVE that watercolor. It’s India ink on paper and it’s 30×22. Perfect for my bedroom or home office. Here are a couple more renditions of his artwork. I love it. Thanks for the call Mark. His blog? … click here. 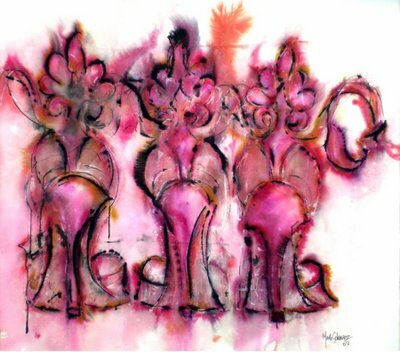 Sad but true … Vivier … Warhol … and high heeled art? Oh this is too much! How could anyone love CSI this much? 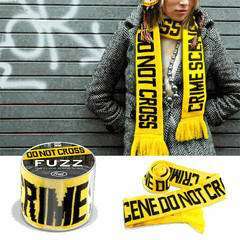 It’s the crime scene tape scarf with the words “Crime Scene DO NOT CROSS” boldly emblazoned across it. Bad bad bad idea. You can also use the scarf to scare the crap out of your housemates when they come home late and see it wrapped around the front door. Just an idea…. Garish is too pretty of a word for these accessoriesfrom hell. 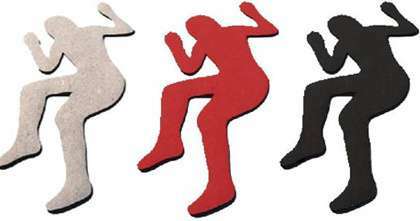 There are other crime scene accessories to go with like this crime scene carpet. It comes in the shape of a dead body lying on the ground. Yes, it’s true that there’s only one size but they do come in three colors. 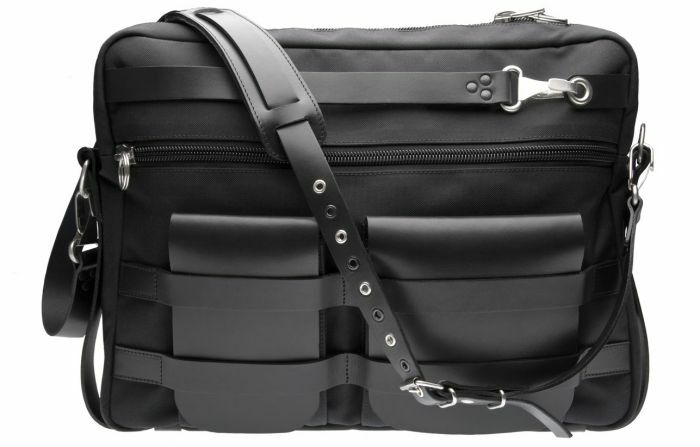 The Ecsotype http://ecsotype.com/bags/presse online store on the other ah … hand has a to-die-for bag called the Presse mixed material utility bag. In addition to its other incredible attributes, there’s a no-shock divider pocket inside to protect your laptop or camera. 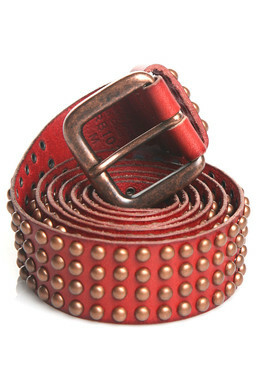 It’s made of leather and nylon with multiple internal/external pockets and a leather-braced gusset. Looks perfect for travel. Check out Mark Schwartz’s blog. 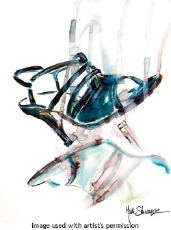 Although … he is rumored to be Oprah’s favorite shoe designer. Check out his web site for many more! Shop on! Hurry, run, quickly, as fast as you can …. If you’re lucky, you’ll be able to catch one of Leanne Marshall’s by-now-famous designs at Seaplane or Foundation Garments here in Portland. If you do happen to see one of Marshall’s designs, grab it up and buy it before someone else beats you to it. I would love to have any one of her designs! Congratulations you Leanimal you! Seriously … the best of luck in our future endeavors. 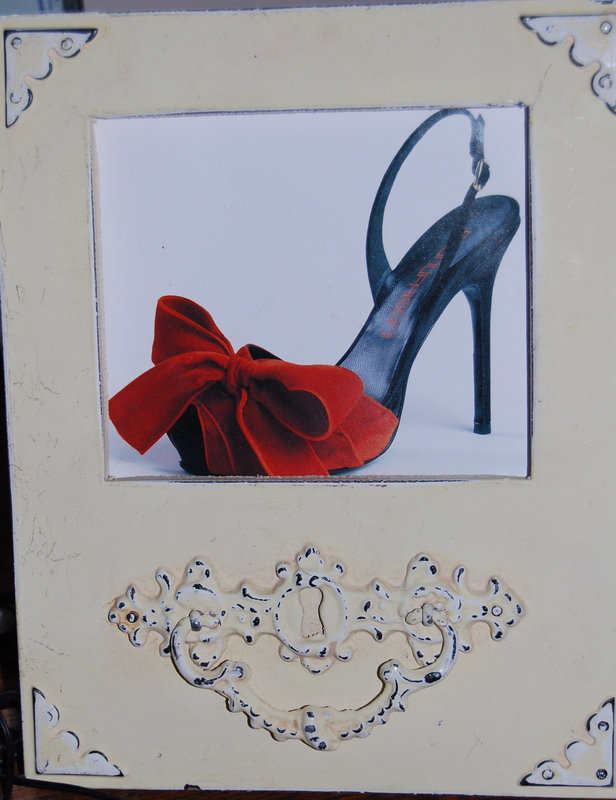 I heart kittwigs.com and fabulous photog … and shoes! Fabulous photographer. Don’t know where I was or what I was doing but I came across this freelance photographer and I was very impressed. Check out her portfolio if you like. 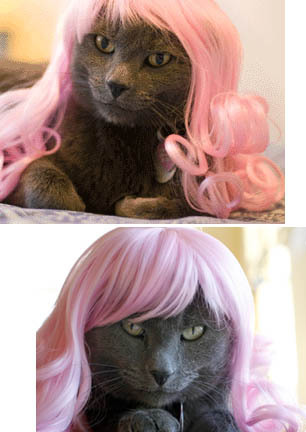 Her name is Jill Johnson and I think it was her photo of Kitty Wigs that I initially saw. Ah… life is too short to wear tight shoes. Isn’t it? Don’t know what that has to do with anything – except that I love cute shoes. 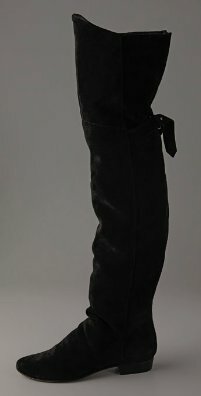 Check out these over-the-knee suede boots with a buckle and elastic gore inset at the back. They’re made by Joie and retail at $475. News nugget: Lindsay Lohan launched her new fashion line called 6126 (Marilyn Monroe’s brithdate) with her favorite fashion accessory – leggings. I know, I know … now you feel soooo much more informed. And last but certainly not least — although I hesitate to promote retail for which Britney Spears is a celebrity spokesperson, I heart these belts by Rough Roses! Isn’t it gorgeous? I love their stuff! That’s all I have. That’s it, that’s all.